If you are missing a single tooth, an implant and a crown are able to replace it and provide you with a natural-looking-and-feeling tooth. You will be able to regain a complete smile as well as your confidence. We here at BC Perio Dental Health & Implant Centre are proud to provide this service. Dental implants offer many benefits that other tooth replacement options simply do not have. Implants are able to be placed without affecting the neighboring teeth. This means that you will receive a restored, better-than-ever smile with no effect on your other teeth. The implant will act just as a natural tooth would. Other common treatments for a single lost tooth, such as a tooth-supported fixed bridge, requires that the adjacent teeth be ground down, and dental implants provide a clear alternative to these. Because dental implants replace the root of the tooth, the underlying bone is better preserved. The implant will integrate with the rest of your jawbone, which helps it to remain intact, well-supported, and healthy. Bridges cause some of the surrounding bone to deteriorate. The dental implant offers the benefit of maintaining the integrity of your dental and jaw structure. Single implants are easier to keep clean and provide a better overall appearance than a bridge. With bridges, the surrounding gums may recede and expose the metal base or collar. Many patients find this obvious aesthetic effect to be a drawback of bridges, and a single-tooth dental implant negates this issue. 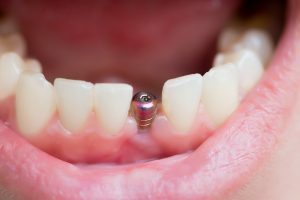 How do Single-Tooth Dental Implants Work? The implant is first placed into the jaw. It looks like a screw, and initially it will be covered by a temporary tooth replacement. Once the implant and bone are able to bond together and form an anchor, the artificial tooth will be placed and restore your natural smile. Once your implant has been placed, your new and improved smile will enhance your ability to chew and speak. The implant will look so natural that no one will be able to tell that you lost a tooth, not even you! The natural and streamlined feel of an implant allows you to have a complete, natural-looking smile. Enjoy the confidence that comes with a brand new tooth! Our dentist will work with you to provide the best possible tooth replacement option and smile restoration for you. Call us today at BC Perio Dental Health & Implant Centre (604) 872-0222 or Coquitlam (604) 936-8244 to schedule your appointment!